Mini Musco offers the same high-quality, precise lighting that we’re known for, in a smaller and more maneuverable package. 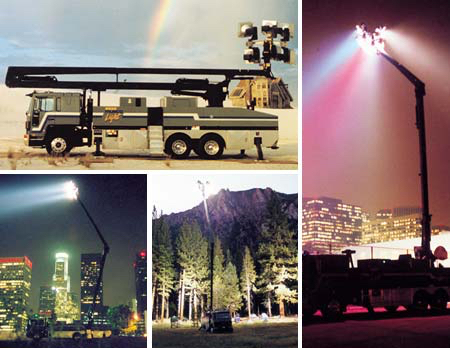 Whether it’s a small baseball field, outdoor event, or a movie set with tight locations, Mini Musco provides the kind of mobility and versatility that no other sports lighting solution can match. With its more compact truck chassis, sound-attenuated generator, multi-directional lighting, and 360-degree rotation and 210-degree tilt capabilities, Mini Musco provides maximum flexibility to meet a wide range of lighting needs. The system includes a bank of high-output lamps on a fully-articulated 80-foot boom, ensures flicker-free operation at any camera speed and shutter angle, and delivers precise, high-quality lighting. Mini Musco has even earned us a Technical Academy Award for movie lighting. Mini Musco is completely self-contained. It features a streamlined design, and with an experienced Musco technician at the controls the system delivers convenience, minimized set-up time, and reduced labor costs.